With all the recent Wisconsin rain, I was a little nervous about the CSA share I bought from Home Grown Wisconsin. But their newsletter and e-mails have said things don't look too bad for their farmers, and they came through like champs yesterday with our first delivery. One of the biggest reasons I joined was to try and challenge myself to cook with more veggies. There were no surprises in this particular box, but I think as time passes it'll be a good way to gently bully myself into cooking with more greens and things. I got my first box of veggies, cheese share, and egg share this week. The cheeses were plain cheddar and a pesto-cheddar. For veg, I got lettuce, asparagus, radishes, green garlic, rhubarb, chives, mint, spinach, a carton of white mushrooms, and a jar of pear butter. As I was washing the produce, I was amazed how clean most of it was. The radishes were cleaner than expected. The spinach was still in bunch form and surprisingly clean too. Everything was in great shape and I decided a veggie dinner was in order. A couple slices of pesto cheddar with wheat wafer bread, some steamed asparagus with coarse salt and butter, and a bowl of sliced raw radishes and steamed spinach topped with chives, salt, olive oil, and red wine vinegar did me right. The asparagus was fresh and sweet. The base of the stalks were completely moist. None of that dry stuff you find in the store. No need to snap the ends before steaming, just a tiny slice off of each. The spinach was also incredibly sweet against the mildly peppery radishes. I could have eaten the whole block of the pesto cheddar, but I'm sure it'll find it's way into a grilled cheese at some point. For dessert, I tried the pear butter on some wheat toast. Also quite good. Anyone else getting started with their deliveries this season? Don't ignore the radish greens, they make for a nice peppery salad--do wash well as they greens are often not washed as good as the bulbs. petermavrik wrote: Anyone else getting started with their deliveries this season? I'm also getting Homegrown Wisconsin deliveries (every other week, including eggs). You beat me to the punch in posting about it. I photographed my delivery (which looks the same as yours, for obvious reasons) and I had been planning on doing a season-long "anatomy of a CSA" thread. Hopefully, this weekend, I'll post my taxonomy of this first delivery. Overall, I'm pleased with the delivery. We used the rhubarb right away. It found it's way into a strawberry-rhubarb crisp using berries from the federal plaza farmer's market. It was excellent. Tonight, I'll be eating a good amount of the lettuce for sure. If you can't keep upwith eating the cheese let me know I will take that horrible burden off your hands. This stuff looks great just like our farmers markets in Chicago. petermavrik wrote: As I was washing the produce, I was amazed how clean most of it was. Exactly the opposite for me. I was shocked at how much sand/clay had taken residence in my head lettuces. I haven't seen greens that gritty in a while. Still, I had a nice salad tonight with the mesclun (which I got instead of your spinach). And really, I don't mind putting in the time to wash, store and prep produce. I'm of the Alton Brown school of process it when you get home and then it's easy to use when you need it. If it is soaked, spun and spiral-wrapped in paper towel (and as fresh as the dirt would have me believe), this lettuce will keep 10 days easy in the crisper. good thing I love me some salad. Sometimes I'll get back from the farmer's market and before I know it, an hour has gone by washing, drying, slicing wrapping and stowing safely away. Totally satisfying nonconscious work. I look forward to some more veggies in 2 weeks. I think we'll be seeing some scapes. Time for some more scape-walnut pesto. Incidentally, I checked out How to Cook Everything Vegetarian as well as Vegetarian Cooking for Everyone from the library in a try-before-I-buy test drive (as I do with most cookbooks). This has really made me excited about summer. I am not a vegetarian but I am getting bored with cooking meat recently. However, the thought of new and distinctive ways cook and celebrate the vegetal bounty of the season puts a spring back in my culinary step. Books like these are good for a CSA subscriber when some random things like kohlrabi start coming home in that box. For recipes that are good and so simple, they are more like paragraphs than ordered directions, Chez Panisse Vegetables is also a good one. 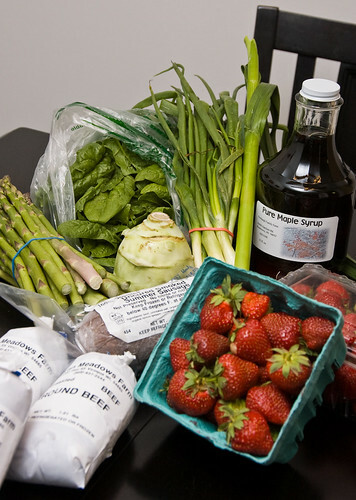 This is the first picture of a CSA delivery that actually makes me want to join. Keep on posting pictures if you can. I'm already thinking of signing up next year. The mix of cheese/eggs/pear butter with the veggies really seem to make it a more substantial delivery. BTW, if you can get your hands on a copy, The Arrows Cookbook would be great for this sort of thing. It is written by the authors of the self same restaurant in Maine who prepare food from their own enormous garden, so the book follows the seasons with recipies using whatever foods are available at that time of the year. I've made some excellent meals out of it. I'm so jealous! My first delivery got delayed this week. Luckily the farm is not in trouble, but many of the roads were out and Sheriff's Dept told people to stay off the roads if they could. So my first delivery should be next Tuesday if this damn rain ever stops. Your first delivery looks to be loaded with great stuff. Our CSA is from Sylvan Meadows Farm out of Viroqua, WI. http://www.sylvanmeadowsfarm.com/home.html (not much going on, on the website). Pictured from left to right are: Lettuce 1 (some kind of summer crisp), eggs, spinach (in plastic bag), asparagus, mushrooms, lettuce 2 (some type of bibb), radishes, green garlic, rhubarb, mint (in baggie), chives, pear butter. Homegrown Wiconsin provides a nice PDF newsletter for each delivery that lists the farms providing the produce, storage tips, recipes, and more. Here's the newsletter for this delivery. We ate the bibb lettuce in a salad right away since it wilts so quickly (I gave it a good long, cold bath to revive it a bit after a night in the fridge). The rhubarb went into a crisp (mentioned upthread) and the pear butter is nearly gone already (on toast or in yogurt for a couple breakfasts). Overall I'm very happy with this delivery (which cost me $36.50--one tenth of the fee. If you go for every week, the cost is about $5 less per delivery). I feel like I got my money's worth of high-quality, seasonal local produce that's all completely usable. I doubt we'll waste anything. I'll be getting deliveries every other week (a half-share), with the additional egg share. I'll post every delivery in this thread. @vital Yes. Radish greens are indeed tasty. I like them on sandwiches because they add a bit of bitterness. @eatchicago We'll have a dueling photo contest on this thread! @brandon_w Please post photos when it comes in. @wak For sure! I think the best part will be actually seeing what you get. I tend to follow my eyes and my nose when shopping for produce, so it was kinda hard for me to consider spending money on a CSA when I could jaunt over to the farmers markets and see the produce. But so far so good. I am so excited about this CSA thread! I'm a Home Grown Wisconsin member too - weekly share, plus eggs. Also doing the winter share with eggs and cheese. Also doing the Grass is Greener meat CSA. What can I say - I'm a CSA junkie?! The newsletter was really well done, and I love reading about the folks growing our food, plus the recipes. I thought the produce this week was beautiful, and we've been enjoying it all week! BIG salads for dinner with grilled beef or chicken, topped with some of the asparagus and sliced strawberries from the farmer's market. Sauteed spinach with green garlic and a little soy with brown rice, and a couple of over easy eggs - YUM. I love the creativity that comes from the weekly deliveries, and trying things I might not buy on my own, and creating new combinations of flavors. Its a very fun time of year, and I feel very lucky to have CSAs available! Oh, and the EGGS...I have to pace myself on those, as they are SO fresh and delicious, bright orange yolks...absolute heaven! I just joined the Homegrown Wisconsin CSA too! I was really excited for the first delivery as I just read Barbara Kingsolver's "Animal Vegetable Miracle" and am earnestly attempting to up the ante on the amount of local produce we eat. We've gone to farmer's markets for years, but sometimes I get stuck in a rut about what I buy. So I'm looking forward to the variety too. Decided to do the half share with eggs so I can still rely on the farmer's market on the off weeks. Thanks for starting the thread and looking forward to hearing what everyone is doing with their shares! SBE - my husband was NOT a lettuce guy when I met him - had no use for the stuff. But to me, a salad is about topping it with something tasty, and using a really great dressing. I don't buy salad dressing, won't touch that bottled stuff. But a homeade vinaigrette is a revelation! Current favorites: soak 1TB dried cherries in 1/2c champagne vinegar (to speed things up, heat the vinegar in the micro for 15 seconds) Blend the vinegar and cherries in a mini-food processor. Add dijon mustard and olive oil and emulsify and add more oil/mustard as needed to taste. Top salad with grilled chicken, fresh strawberries or apple slices, pecans, crumbled bleu cheese. Caesar salad - make your own caesar salad dressing - frighteningly easy, and with the beautiful CSA eggs - SO delicious! The husband actually comes home now and requests salad with dinner, so I suppose my salad campaign has been a success! This thread in the gardening forum offers a variety of nonsalad ideas for cooking with lettuce. To the tips there, I would also add grilled lettuce, creamed lettuce and using lettuce as a wrap for grilled meats and other foods. Also, here are recipes for lettuce wine. Thanks for all the lettuce ideas! We're actually pretty creative about using lettuce already (although I have to admit Lettuce Wine is a new one). I made a tasty yogurt & mint dressing over green garlic and lettuce last night. I've become quite a mustard vinaigrette maker in the last couple of years too. Overall, the portion of other items in the salads (asparagus or green beans or almonds) being greater than the lettuce portion is just a personal preference. Guess I'll just need to increase my overall volume of salads - which isn't a bad thing with the warm weather upon us. I do enjoy grilled lettuce and had forgotten that as an option - so maybe I'll try that again soon! Everything looks great. Tomorrow night I'll be making burgers with some of the beef, cooking down the spinach with some mustard greens from the farmers market and maybe grilling a bit of the asparagus. Ate a few strawberries tonight and they were great. I'm really happy, I was excited all day. Great package & photo!!! Which CSA are you a member of? Well, I think so far this year, we're losing the veggie wars....0-1 on the season thus far. We've still got one head of lettuce pretty much untouched, mint, and a few radishes untouched from last week's box. I think I stuck myself last week though, as I had gone to the farmer's market on Saturday, and I can't resist all the fresh veggies, so the CSA box last week was just a bit over what I actually needed. I aspire to get through everything next week! I'm a Home Grown Wisconsin subscriber too - loved the radishes (sliced into a salad and sauteed with olive oil, greens, green garlic, and chives)! As a novice cook and recovering picky eater, this is my first experience with a CSA summer share. I signed up with HGW last winter after falling into a big food rut, but since joining I have become a more adventurous and healthy eater. I love the idea of having to create meals around whatever comes in the box. I'm chronicling my CSA experience on my blog: http://www.woodentable.blogspot.com. Please stop by. I'd love to swap recipes and hear about your own CSA experiences. Jenn_in_RoPa wrote: Great package & photo!!! Which CSA are you a member of? brandon_w wrote: Our CSA is from Sylvan Meadows Farm out of Viroqua, WI. Do you know what areas this farm is able to serve with their CSA? Is Madison the only city covered? Farm pickup and drop off's in Madison only. --Eggs, of course (note, this is an add-on to the normal CSA share). I'm very pleased with my second delivery, especially since we easily used everything from our first. I'm delighted to have berries and rhubarb. The zucchini will give me an opportunity to try this little recipe/tip from Eric Ripert that I've been sitting on for a couple weeks. Scapes, parsley, and mushrooms are always welcome as they are easy for me to work into my regular cooking routine. This delivery is clearly long on leaves. I'm looking forward to cooking the collards, which I've never done before, and I'm going to have to come up with some creative uses for the napa (please don't tell me to make slaw). Also, is there anything you can do with grape leaves besides stuffing them with rice and meat? Another great box this week, and thanks for the pics - I always mean to take pics, but then I just rush in and start cleaning them, and then the moment is gone. I'm also stumped by the grape leaves - I think I'll try making Dolmades - they are my favorite thing at middle eastern restaurants, but I'm afraid mine may not measure up, and it seems like a lot of work, when we only got a handful of leaves. Maybe I'll go to the market and buy a jar, so I can make a bigger batch. The greens are piling up in our fridge too - I still haven't figured out what I want to do with the escarole from last week - eeep! But I got the lacinato kale, which I adore, so that's no problem, and the napa is gorgeous - and HUGE! I think the husband and I ate half the box of strawberries just standing around cleaning veggies - SO good! I wish I was able to go to the strawberry picking event this weekend, but its just not going to work out. Bummer. The thought of making kimchee is rolling around in my head....hmmm. Never made it before, might be a good time to try. escarole and bean soup or braised escarole with parmesan Good stuff. I dug up a lot of these when I had a veggie box from Timber Creek Farms; I'd all but forgotten them. Escarole is an autumn green as well, yes? A very nice salad recipe, thanks. Usually I've mainly used napa as an addition to homemade dumplings or in quick asian stir frys. But this salad is a very nice summer option, especially now that tomatoes are starting to show up. Believe it or not, we had it for dinner less than 5 minutes ago: the 'spouse dug up my recipe box on epicurious to make it, as it's Sparky's favorite salad, ever. If you don't want to make dolmades (and it doesn't really look like you have enough grape leaves for very many), grape leaves work well for wrapping fish or meat before grilling or roasting. Here's a recipe for grilled stuffed grape leaves with goat cheese and black pepper. You probably want to blanch the leaves before using them. Or you could blanch and freeze the leaves and hope you get more next time. eatchicago wrote: The zucchini will give me an opportunity to try this little recipe/tip from Eric Ripert that I've been sitting on for a couple weeks. Wow, I've never seen anyone julienne parsley before. Looked beautiful. I might give this a shot as I am often at a loss as to what to do with zucchini. I would have gladly traded my 3 extra zucchini for your scapes. I loved the variety of verdure in today's box, but I have just about ceded the bottom half of the refrigerator to lettuces. Nevertheless, I do have designs on the napa. It was unlike any other napa head that I have seen. Somehow lighter, looser and less dense. Bittman has a quick pickle recipe. Basically toss 6 cups shredded cabbage with 1 tbsp of salt, mirin, soy sauce and szechuan pepercorns then throw in a colander and let it sit, weighted for about 30 minutes. Finish with dark sesame oil. I don't think it will be Lao Sze Chuan quality, but it's a start. Escarole? Saute then braise with a wee bit of chicken stock. Finish with drained and rinsed canned beans if you like or just finish with a little s&p and some white whine vinegar. As for the collards, I prepared a Brazilian-style dish with them before, dressed with crisped bacon and reserved bacon grease. While searching for it, I found this which looks interesting. And for those, like me, that got lacinato kale instead of the collards, my favorite prep for this actually came from the HGW newsletter last year. Basically sauté mushrooms (convenient) in olive oil with some shallots. Chiffonade the kale and toss with a lemon vinagraitte, the mushrooms, lemon zest and grated or shaved ricotta salata. Very tasty. I could try to dig up the recipe if there is interest. gastro gnome wrote: Wow, I've never seen anyone julienne parsley before. Looked beautiful. I might give this a shot as I am often at a loss as to what to do with zucchini. I would have gladly traded my 3 extra zucchini for your scapes. Oh, man, life is too short to julienne parsley. Put the leaves in a narrow jar and snip with scissors. The classic use for extra zucchini is, of course, zucchini bread. But my favorite prep is fried. For the most elegant prep, slice like Ripert showed, dip in egg and fine crumbs and deep fry. The erstwhile Papagus used to do this and then arrange the slices in a flower shape and serve with skordalia. I usually slice a little thicker, salt and let stand a bit, then egg and bread with matzo meal and pan fry. Zucchini jam is an interesting recipe. I've also seen a lot of recipes where zucchini stands in for apples, as in this zucchini strudel.